The video by Madrid police sees officer dramatically fall to the ground before lying down and staying perfectly still. The video clip of a dog giving CPR has gone viral on Twitter and has got nearly 2.2 million views since it was uploaded. 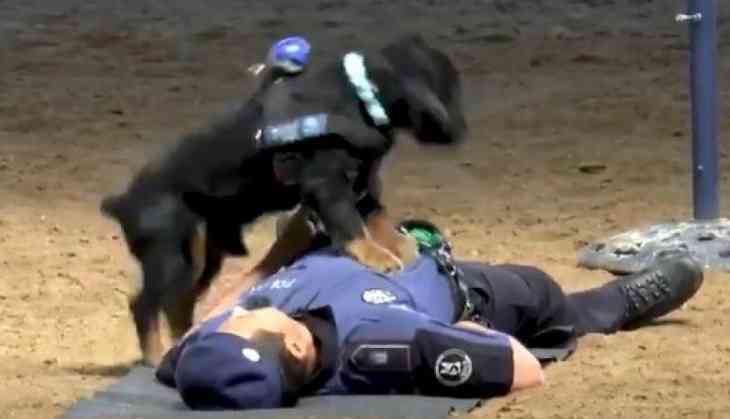 An adorable smart dog wearing a flashing police light can be seen as ‘saving’ the life of his fellow trainer by performing medical treatment like CPR on him. The video was captured and posted by Madrid police on their Twitter handle sees the police officer who dramatically falls to the ground before lying down and staying perfectly still. In the video, the dog named Poncho ran towards his fallen handler straight away and tries to wake him up by pushing his side. It was also seen that the dog tries to check his heartbeat. When the officer does not react or respond, the dog jumps up and down on his chest four times and then place his ear next to the police officer’s mouth to check for any signs of breathing. After doing that, he goes back and jump up and down and repeat all the moves once again. "Heroic" performance of our #4pawedcompanion Poncho, who did not hesitate for a moment to "save the life" of the agent, practising the #CPR in a masterful way. The video clip has gone viral on Twitter, receiving nearly 2.2 million views.